The best fine nib Lamy has made! The Lamy Studio is a metal pen - I believe, but couldn’t confirm, that it is made from brass, given the weight. Like both the Lamy 2000 and the Aion, the Lamy Studio is a tubular, minimalist designed fountain pen in a Bauhaus style. The Studio comes with a chrome plated grip, a coated, coloured body and cap, and a unique propeller-inspired chrome clip. Chrome squared-off end caps sandwich the design. 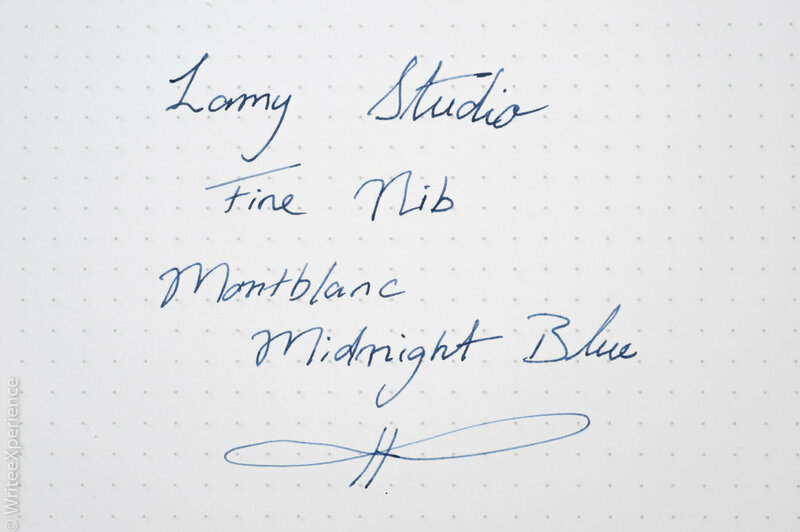 My Lamy Studio is an attractive blue colour. This is a dark blue that matches nicely to the Montblanc Moonlight Blue (a blue-black) that I inked it with. The cap on the Lamy Studio snaps on and off - allowing easy and quick access to the pen. The cap also solidly posts after snapping on to the rear of the pen. I find the pen a little heavy and rear-weighted when posted and don’t usually post this pen. Which is odd as I typically prefer a posted pen. 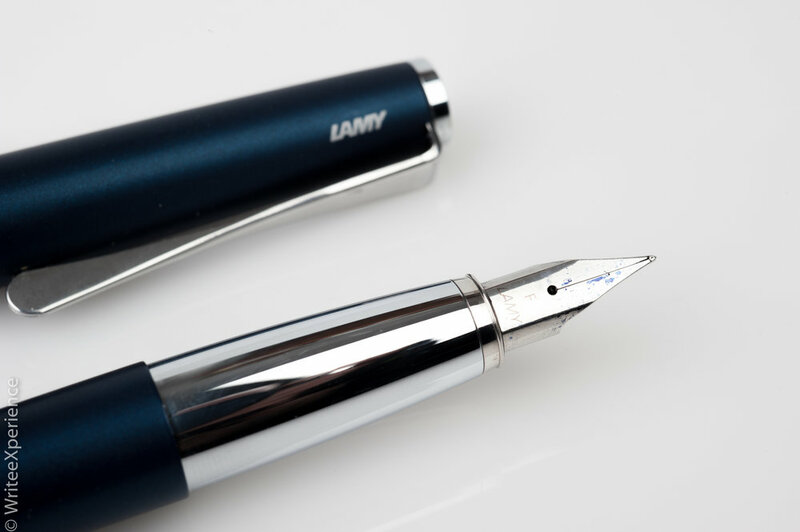 The steel nib is a standard Lamy Safari design, which is easily replaceable with other sizes. The Studio does come with an optional gold nib, though at a much higher price point. This pen is equipped with a fine nib - however, it writes much finer than the extra fine nib in my disliked Lamy Aion. I really like this smooth writing nib and seem to have received one of the best steel nibs that Lamy produces. I am not sure if that is by luck or design of the pen. The Lamy Studio is a cartridge/converter pen. My used pen came with a converter, but keep in mind that Lamy sells the converters at an extra cost (around $10 CDN). 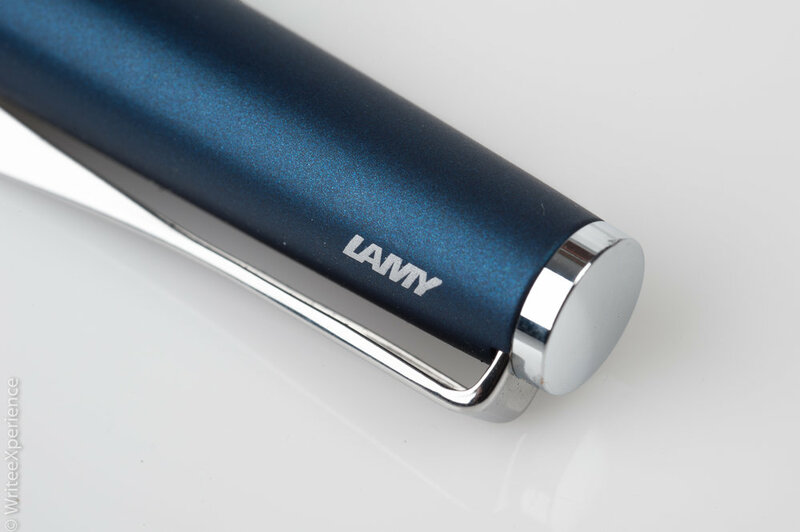 Lamy uses a proprietary cartridge design and not an international standard, limiting ink choices without a converter. However, I did find out that Parker Pen refills also match the Lamy cartridges sizes, which may provide more ink options over the standard, dry writing, and expensive Lamy cartridges. I really like this writing experience of this pen. Apart from my 14k gold-nibbled Lamy 2000, this is the best Lamy nib I have ever written with. The nib writes smoothly and never hard starts. The ink doesn’t dry too quickly on an uncapped nib and with the fast access snap cap, this pen an excellent note-taking pen. As it also is a professional looking pen, I find this to be an ideal work pen at my jobby job. This is a solid metal pen and may be too heavy for some writers even if not posted. The size is perfect for medium to large hands. For writers with slicker grips (or sweaty palms), the chrome grip section may become slippery and awkward. The chrome plated metal grip section is my biggest challenge with this pen. With sweaty hands from long writing sessions, I find my grip slips down the pen toward the nib as I write. If I don’t reposition my grip regularly, this writing position quickly becomes uncomfortable for me and causes my hand to cramp. I think that the weight of the pen is also a factor in the hand strain I sometimes get after long writing sessions. Despite a couple of challenges with this pen, I really do like the Lamy Studio. The nib is a perfectly smooth writer and is comfortable for writing notes and short-form writing. I like the unposed weight. This pen feels much more robust than the Safari and less cumbersome than the Aion. With the steel nib option, it is also more affordable than the Lamy 2000. With the professional design and pretty colour combinations, the Studio has become part of my daily work carry; the snap cap is perfect for quick notes that I need to take during the day. I would recommend testing this pen out in person before purchasing. The weight and chrome grip won’t be for everyone. like this pen now and feel that it is almost everything that the Aion should have been.